Tashaun Gipson continues to take the NFL by storm as he came up with his league leading 6th interception on Sunday. Malcom Floyd, WR, San Diego Chargers- Floyd caught 4 balls for 60 yards, with a long of 18 yards in the Chargers (5-4) 0-37 loss to the Dolphins. Floyd leads the Chargers in receiving yards with 530 and is 3rd on the team in receptions with 28. Floyd is 3rd in the NFL in yards per catch. 2014 Stats: 9 G 9 GS 28 REC 530 YDS 18.9 YDS/REC 58.89 YDS/GAME 3 TD. Tashaun Gipson, S, Cleveland Browns- Well, another week and another interception for Tashaun Gipson. Gipson continues to take the NFL by storm as he intercepted a pass for the third game in a row. 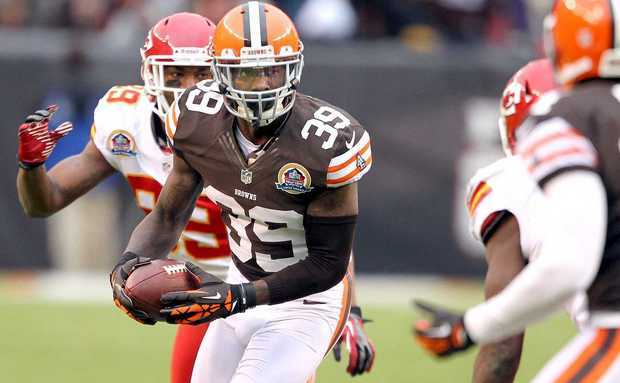 Gipson was also in on 5 tackles in the Browns’ (5-3) 22-17 win over the Bucs. Gipson’s interception, which was returned for 12 yards, was his 6th of the season, which is 2 more than anyone else in the NFL. His 158 yards on interceptions is also good for the league lead and his 13 passes defended in good for T4. You can hear Gipson talk about the Browns win here. Robert Herron, WR, Tampa Bay Buccaneers- Herron was active for Bucs (1-7) 17-22 loss to the Browns, but did not get credit for a game played. Marqueston Huff, DB, Tennessee Titans- The Titans had a week 9 bye. Mitch Unrein, DT, Denver Broncos- Unrein was active for only the second time all season in Denver’s (6-2) 21-43 loss to New England. He did not record a tackle. Chris Prosinski, S, Free Agent- Prosinski remains a free agent after playing in the Jaguars first three games before getting released after a hand injury. Prosinski met and worked out for the Eagles last week, and was signed on Monday afternoon. Howie Roseman announces team will sign safety Chris Prosinski, formerly of the Jaguars.